Lot Size: 6000sq. ft. n/a "Corner, Rectangular"
Why rent when you can buy!?! An opportunity to get into the real estate market in the thriving community of Rouleau, Saskatchewan. 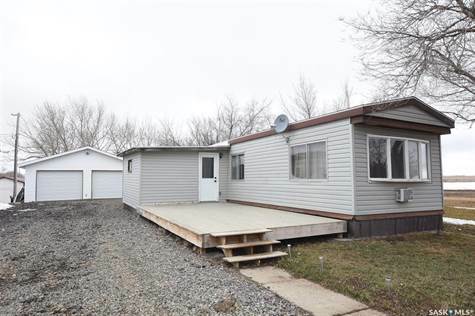 This two bedroom mobile home is situated on an owned corner lot and to enjoy! The open concept is great for entertaining and the porch allows for all the gear needed for those toys you're storing in the garage! Some newer flooring, baseboards, drywall, doors, sinks and countertops, plus a spa like bathroom. The large master bedroom is at the back of the mobile next to the bathroom which is conveniently across the hall from the side door that leads to the newer deck. The detached, insulated, double garage is sheeted with moisture resistant sheeting and a huge asset to this property. Newer shingles with industrial materials on the roof. Work hard, play hard in Rouleau! Call today!